Here are my two E-books that I worked really hard on. One is how to start eating healthier with tons of yummy recipes and the other one is my gluten free cooking book. I hope you like them and thanks so much for your support! Join Eat Good 4 Life Affiliate Program and obtain 50% of the sale! Do you want to eat your way to health? Do you need some guidance on where to start? My intent with Eat Well, Live Well E-book is to give you a starting guide on how to start learning how to eat healthy. I have worked really hard to give sensational full proof recipes that you can try time and time again. 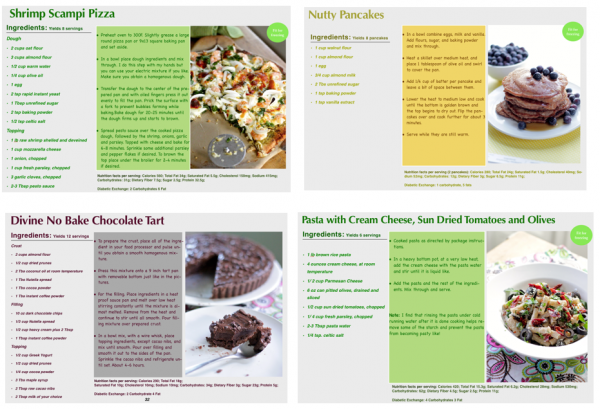 In Eat Well Live Well you will see recipes, like desserts, where recipes have been modified to be able to be eaten almost guilt free and at the same time nourish your body. By swapping unhealthy and fake ingredients for the best quality ones, almost any food is off limits. This is what I show you in this fantastic easy to follow cookbook. 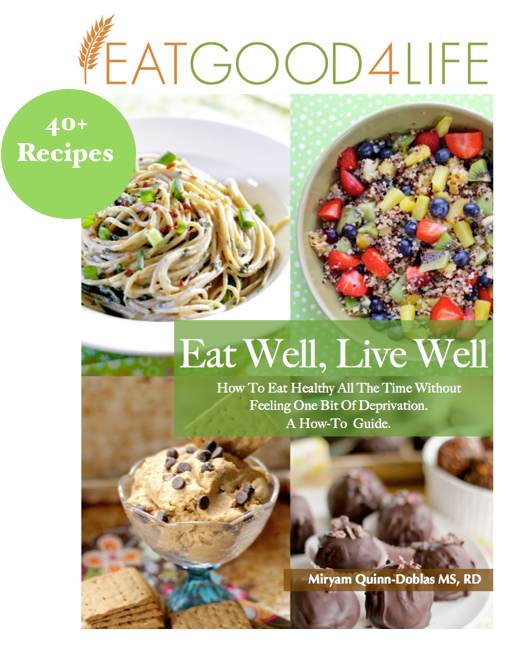 What is in the Eat Well, Live Well E-book? A 8 page comprehensive guide on how to start eating healthy. The book contains 8 chapters of brand new, never seen recipes which includes breakfast (6), nourishing snacks (5), energizing smoothies (5), quick meals (9), salads (6), international foods (6), and desserts (6). 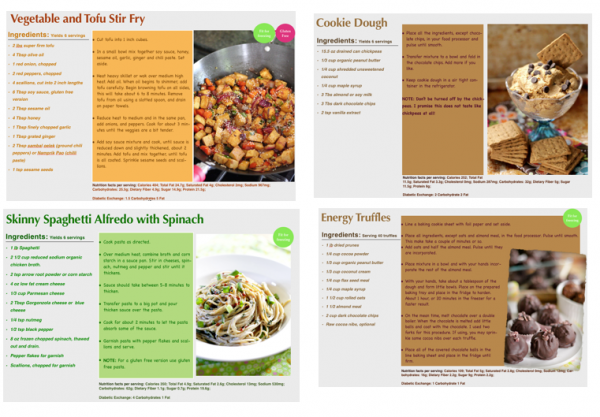 Nutrition facts with carbohydrates and fat exchanges for each recipe included. Recipes that are full proof. A total of 43 recipes. Over 75 pages of full color photographs. 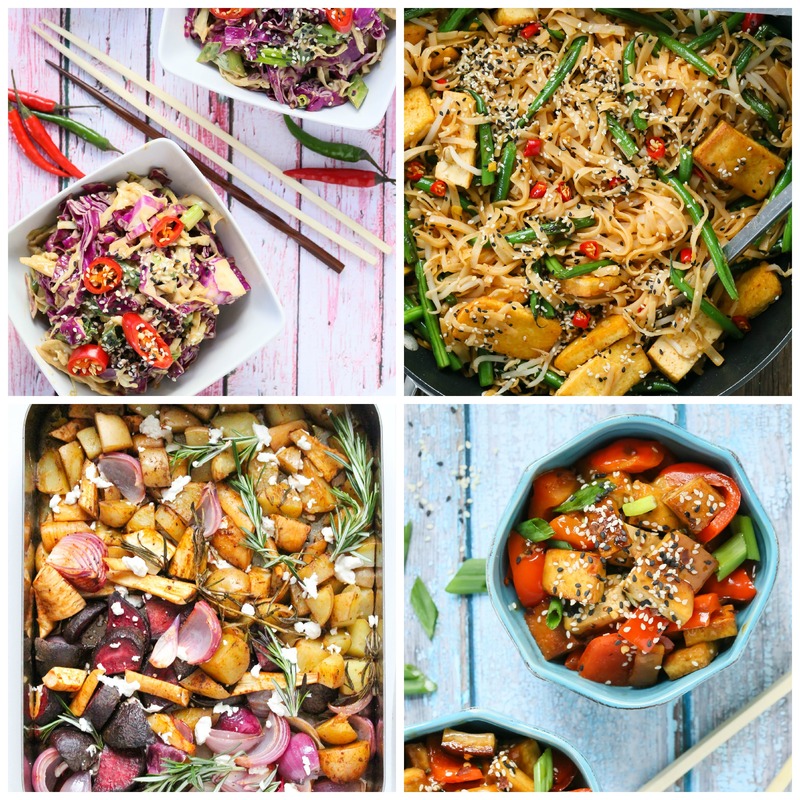 25 + vegetarian recipes. Remaining recipes can be turned vegetarian and vegan by replacing the main protein in the dish to a vegetarian option, substitute the cheese with vegan versions and/or use flax eggs in place of real eggs. The e-book is on PDF format which can be viewed on your computer, iPad and smart phone like your iPhone. Introduction: A 8 page guide on how to start eating healthy. Some resources included like best sweeteners, fats and flours to use as well as places where to buy them. Breakfast: Carrot cake oatmeal, mixed berry refrigerator oatmeal, banana, apple and oatmeal muffins, blueberry and oatmeal breakfast muffins, dark chocolate and peanut butter oatmeal, huevos rancheros. Nourishing snacks: Frozen mixed berry frozen treats, slim whole wheat mini pizzas, rice cakes with bananas and honey, mint hummus, mixed berry English muffins. Energizing smoothies: Mint dark chocolate chip smoothie, oatmeal bliss smoothie, lowering cholesterol smoothie, super power Goji berry smoothie, chocolate bomb smoothie. Quick meals: Easy one pot chicken, chicken cacciatore with broccoli, penne pasta with walnut sauce, buffalo chicken mac and cheese, spaghetti with walnut sauce and mussels, tomato and pepper salmon bake, skinny fettucine Alfredo with spinach, beef stroganoff. Salads: Quinoa veggie salad, Asian noodle salad, quinoa fruit salad, peanut noodle pasta salad, whole wheat couscous Asian salad, Pear and goat cheese salad. Easy international foods: Vegetable and tofu stir fry, Asian chicken and broccoli, Teriyaki Mahi Mahi, Thai fish burgers, curried lentils, tofu Penang curry. Gluten free desserts: Fruit parfait, chick pea truffles, energy truffles, not your average rice crispy treats, peach crumble, cookie dough. 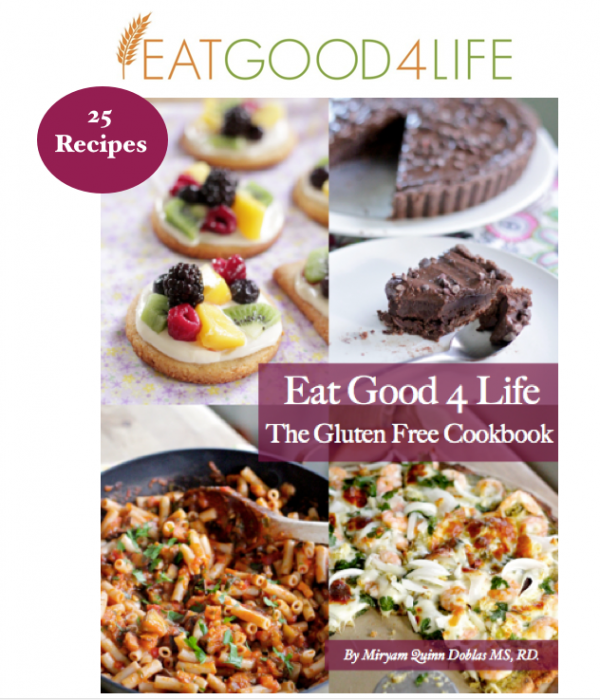 What is in the Eat Good 4 Life, The Gluten Free E-book? A small guide on Celiac disease with some key resources. Over 35 pages of recipes and full color photographs. The e-book is on PDF format which can be viewed on your computer, iPad and iPhone. Introduction: A 2 page guide explaining Celiac disease as well as some resources. Breakfast: Banana and chocolate muffins, probiotic smoothie, nutty pancakes, mixed berry refrigerator oatmeal, mint dark chocolate chip smoothie. Snacks: Dark chocolate mousse, mint hummus, rice cakes, frozen mixed berry treats, dark chocolate apple slices with almonds. Main meals: Shrimp scampi pizza, pasta with tomato sauce and eggplant, vegetable and tofu stir fry, baked wild salmon with veggies, pasta with cream cheese, sun-dried tomatoes, and olives, tofu stir fry with peanut sauce, Thai rice noddles with Mahi Mahi, Chipotle fish stew, quinoa salad, skinny spaghetti Alfredo with spinach. Desserts: Sugar cookies, mini fruit pizzas, Nutella cookies, divine no bake chocolate tart, cookie dough. 1. Do I need a special device to open the eBooks? No. A PDF can be opened on any computer or mobile device which includes your iPad or iPhone. You’ll need Acrobat Reader, which you can download for free right HERE. 2. How do I load the files to other mobile devices? Once you have downloaded the eBook to your preferred device you can send it to your private email account and just open it on any other mobile device by accessing your email account and clicking on the link. 3. Can I print the recipes? Yes. Once the PDF is open on your computer, you can choose just a few pages to print when you find a recipe you want to make. 4. What would happen after I click add to cart? You will be prompted to paypal and be able to pay with any major credit card. Once the transaction is complete the eBook link will appear which you will be able to click and download the pdf file on your computer. 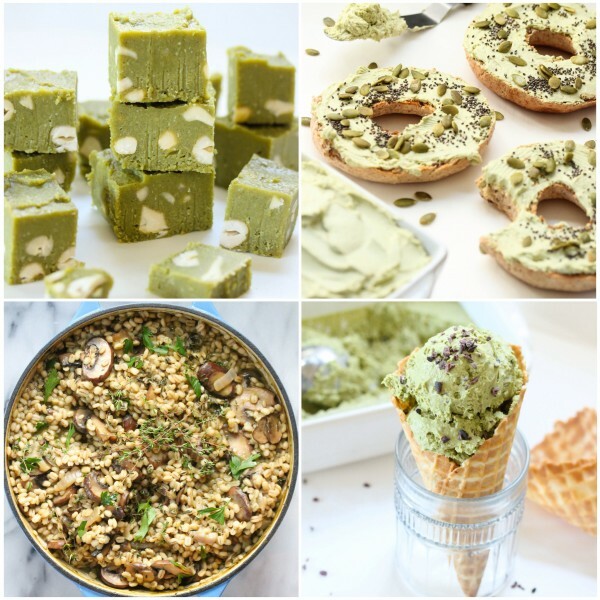 Recipes above: Fudge, cream cheese spread, barley risotto and matcha ice cream. Recipes above: Asian cabbage salad, Rice noodles with tofu, Roasted veggies and tofu stir-fry. Do you want to feel better, have more energy, and decrease the amount of toxins in your body? The health benefits of matcha powder far exceed those of green tea in drink form. The fifty recipes in this cookbook are easy to prepare and feature fresh, high-quality ingredients that aim to incorporate match powder, a powerful antioxidant, into the diet. The Healthy Matcha Cookbook is a great resource that will help you restore and strengthen your mental and physical health. This is a beautiful guide that offers home cooks of all levels the chance to transform meals into satisfying, wholesome, healthy food using one of the world’s most popular superfoods. 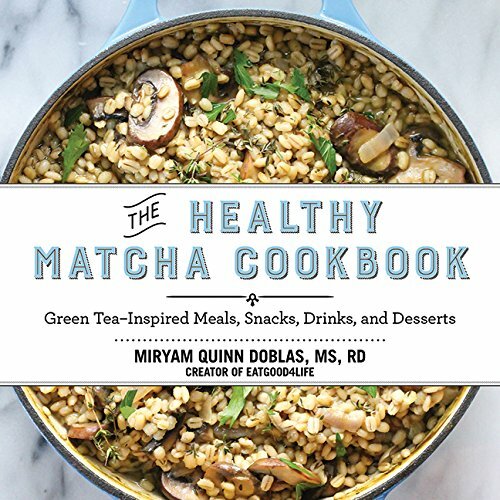 What is in The Healthy Matcha Cookbook? A comprehensive introduction guide that includes: History of green tea, Green tea basics, Health benefits of matcha powder and lists of the major ingredients used in my pantry. 4 chapters which includes energizing breakfast (10), healthy snacks (10), lean green meals (23), decadent desserts (16). Many recipes are gluten free, vegan, vegetarian and dairy free. Substitutions for recipes that are not vegan or gluten free are also given. A total of 59 recipes with colored photographs. Breakfast: Granola, Mango protein smoothie, Overnight oats, Breakfast smoothie bowl, Breakfast frittata, Cream cheese spread, Kiwi and pineapple jam, No bake breakfast bars, Breakfast muffins, Breakfast parfait. Healthy snacks: Energy truffles, Nana ice cream, Energy bars, Kale and hot pepper grilled cheese sandwich, Energizing smoothie, Avocado and eggs on flatbread, Lemon coconut bites, Dark chocolate pomegranate seed bites, Sesame squares, Ricotta and cucumber toasts. Lean green meals: Barley Risotto, Fish green curry, Noodle salad with Asian vinaigrette, Quinoa burgers with habanero mayo, Curried coconut broccoli soup, Quinoa stir-fry, Baked chicken fingers with spicy mayo, Asian quinoa salad, Cauliflower salad, Mac and cheese, Spinach and chive mushroom pasta, Roasted veggies, Oven roasted chicken fajitas, Creamy kale tomato pasta, Cauliflower and thyme soup, Mushroom kale chicken pasta, Mahi Mahi in tomato sauce, Tofu stir-fry, Asparagus and tomato quinoa salad, Lentil and arugula salad, Asian cabbage salad, Kale mushroom flat bread pizza, Rice noodles with tofu. Decadent desserts: Fudge, Coconut ice cream, Chocolate chunk cookies, Blueberry crisp, Flourless brownies, Baked chocolate donuts, Brownie mug cake, Frozen Popsicles, No bake cashew banana pie, White chocolate mousse, No bake coconut macaroons, Whole wheat sticky buns, Chocolate cake with heavy cream frosting, Cream bars, No bake pistachio pumpkin cookies, Apple walnut bundt cake.